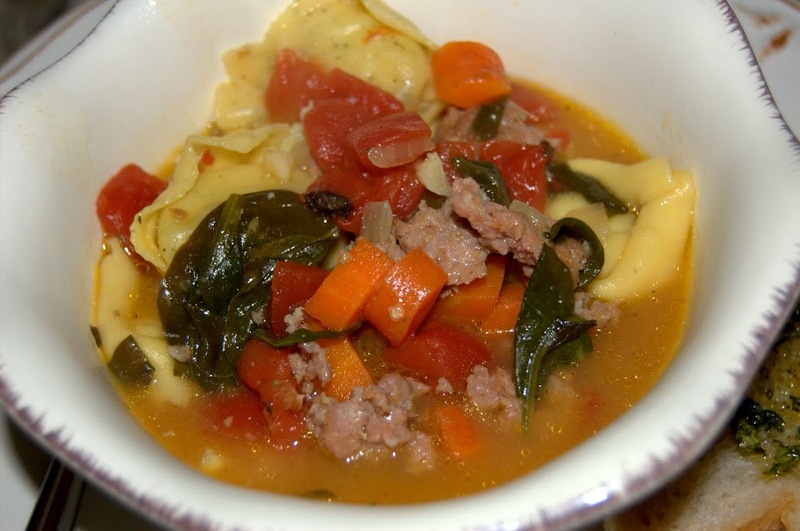 Wait, make that “Tortellini-Are-Little-Puffs-of-Heaven and Italian Sausage Stew.” Kind of a long name, though. I’ll work on it. It’s been a very soup-y fall for me, for a couple of reasons. 1)Fall just seems to need soup. I don’t know what it is but for some reason, fall is a soup season. 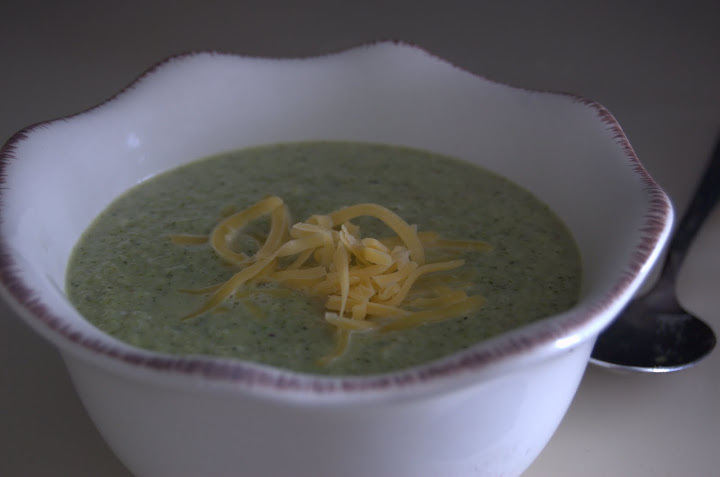 2)Soup recipes make a lot and it’s great for pouring leftovers into a jar and taking it work a couple days for lunch. 3)I rarely made soup before last year because I was convinced I was a failure at it. I’m not nearly as nervous now. Clearly if I can do, any idiot can. But I repeat myself. Sunday was a busy day. I got out of bed–and that was an effort, let me tell you–and made breakfast, prepared bread dough, did the week’s grocery shopping, found out my Twitter account was hacked (again, apologies to all involved), roasted chicken, made stock, made soup and still managed to watch Squid Invasion on Netflix streaming and thoroughly freak myself out. An awesome little episode of I’d Rather Eat In with a local guest chef making Thai Tom Yum Soup. I’d never even heard of this soup before. But now I’m drooling a little bit, I’ll be honest. This entry was posted in General Musings and tagged local, seafood, soup, Thai, video, Ypsi on October 7, 2011 by Lauren. Something awesome transpired here Saturday night. Josh and I hosted the inaugural Melties, a semi-formal grilled cheese dinner party. Let me say that part again. A semi formal grilled cheese dinner party. You know, as many times as I say it, it never sounds less awesome. All around, it’s probably one of my better ideas. I highly suggest that each and every one of you conduct your own Melties as soon as you can. Let’s start with the invitation. 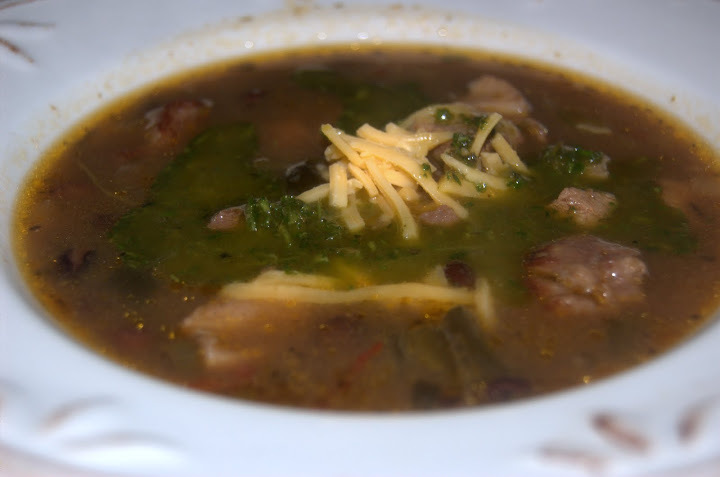 This entry was posted in General Musings, Recipes and tagged beef, easy, soup on January 13, 2011 by Lauren. Oh, Internet. How I’ve missed you. Let me tell you, I’ve had quite a week. The first week of May is always a terrible one for me, at least for the last few years. It is actually the busiest week of my entire year. Those of you who know me in the “Real World” (I’m in Season 27, how about you?) know that by day, I masquerade as my alter-ego, the instructional technology consultant. Or the academic technologist. Or the learning consultant. Or whatever version of that title I happen to respond to on any given day. Anyway, I work for a university and during the first week of May, myself and dozens of others like me (we are legion), put on a campus-wide conference and offer workshops on various technological and pedagogical issues and solutions to faculty and staff. It’s fun. It’s enlightening. And it is tiring as hell. I have so much respect for classroom teachers, such as the delightful Patti from Palate of Patti. It’s exhausting to be up in front of 30 people, trying to teach something most of them consider to be completely alien to them while simultaneously trying to engage both the quick learner and the slightly slower to catch up, whilst still minding your time limits. And doing it for hours. During a normal week, my voice is strained. But this week was even better. Because I got the flu the Saturday before. So that’s great, y’know. Losing my voice, being exhausted. Having to do all the regular duties of my job on top of giving 4 workshops, assisting 2 others and helping to host several large social events and on top of that, the cherry to my sundae of doom, as it were, feeling like complete an utter crap despite sleeping ten to twelve hours a night because I could not stay awake. This entry was posted in General Musings and tagged chili, sauce, soup, stew on May 9, 2010 by Lauren. Ah, Michigan in the spring. This week was day after day of 65 degree weather with full sun and, thanks to Daylight Savings Time, nice long lit evenings. We grilled. We lounged. We ate out at cafe sidewalks. We…did yardwork. It was beautiful. It was gorgeous. It was—short lived. Today’s forecast? Rain and a high of 44. Tomorrow? Gulp. Snow. Sigh. So even though I’m positively itching (that might be the bug bites from the yardwork) to hop on the grilling bandwagon and get my yippy-ki-yay on, I went back to my cold-weather friend, the slowcooker, and decided to try a new recipe…for goulash. 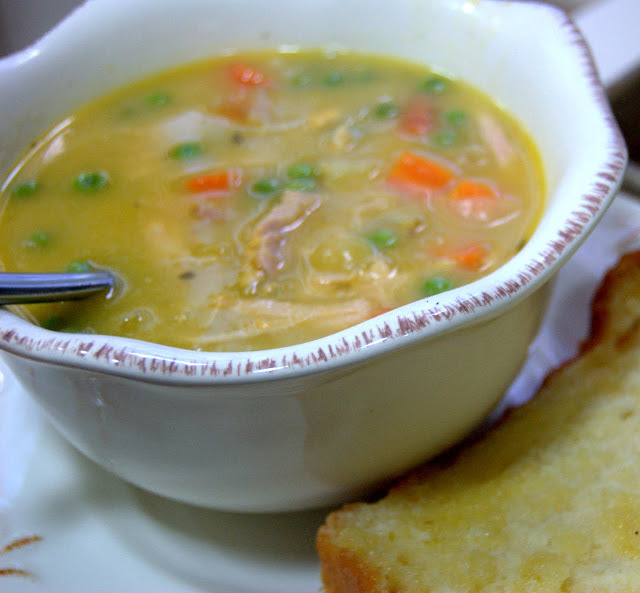 This entry was posted in General Musings and tagged european, hungarian, slowcook, soup, stew on March 20, 2010 by Lauren. This post is brought to you by the letters “Y,” “U,” “M,” “M,” and “Y.” And the number 3. Let’s use those in a sentence. “This meal is 3 kinds of yummy.” Good! This may actually be my favorite of the experiments so far. Granted, there have only been 5–so far—but this is still one of my top ones. My fabulous cousin Carmen picked this Puerto Rican chicken and rice stew to try out; I made it as dinner for Josh and myself tonight and bundled up a bunch to take her for lunch. This dish is not only tasty, it’s informative. It’s taught me at least 3 yummy things. 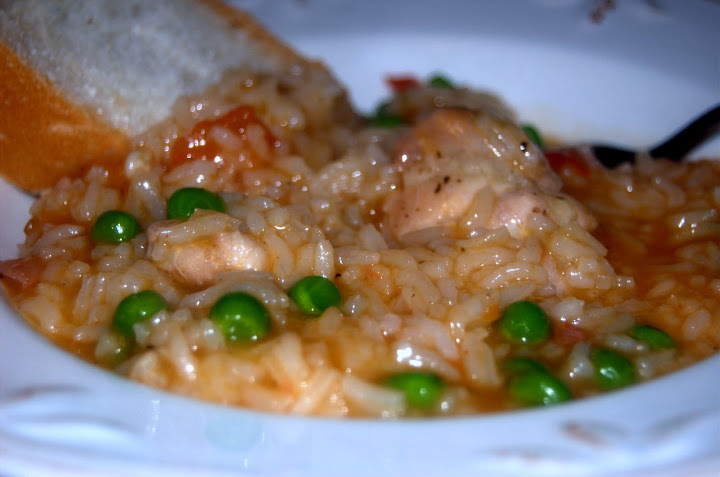 This entry was posted in General Musings and tagged chicken, hispanic, puerto rican, rice, soup, stew on March 14, 2010 by Lauren.